War Child emphasises the charity's historical connections with the music world, but the first money-raiser for our work involved animals. 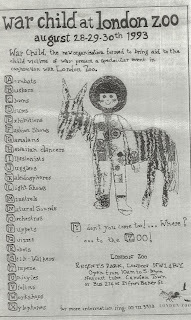 Over the 1993 August Bank Holiday we organised a three-day event at London Zoo. There were sitar and sarangi players near the elephants. Peruvian pipers serenaded the llamas and didgeridoo players the kangaroos. There were African drummers at the giraffe enclosure, gamalan players entertaining the Indonesian rhinoceros, Brazilian berimbau players silencing the normally squealing squirrel monkeys. The Chinese percussionists were kept well away from the giant panda, Ming Ming, because she needed all her concentration to breed. The most amazing sights for me were a string quartet playing Bach in the Butterfly Grotto and a lone cellist in the shadowy depths of the Aquarium entertaining the circling sharks. On the lawns, pathways and courtyards there were clowns, jugglers, stilt-walkers, magicians, dancers and acrobats, story-tellers, poets and pavement artists. Inside the Monkey House we held children's workshops, art and photo exhibitions. 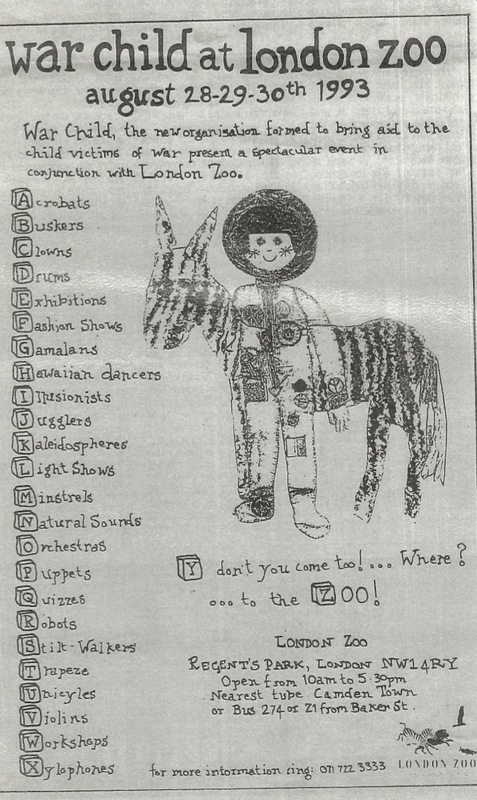 During those three days, London Zoo, with the help of its animals, came to the rescue of another endangered species – children threatened by the thirty wars then raging across our planet. Read more here. I don't usually put animal videos on my blogs, but I can't resist this one.